Famed WSOP dealer ‘Elvis’ Joe was shot and killed in a bizarre crime committed by a homeless acquaintance of his. Check out these leading poker stories in the Weekly Flop! Hansen passes $20m in Losses – Where does it end? Over the past several years, Gus Hansen has been one of the biggest stories in high stakes poker. Unfortunately the reason for the attention has been his massive losses, which have now surpassed $20 million! Hansen’s last week on the Full Tilt tables saw him drop $635,549. According to HighStakesDB, the ‘Great Dane’ has now lost $20,109,870 in online poker. Over one-fourth of these losses have come in 2014, with Hansen losing $5.2 million thus far. This amount easily makes him the biggest loser of the year, and the $20.1 million puts the 40-year-old far ahead of anybody else for career losses. As Hansen’s deficit continues to increase, the question becomes how long he can keep up like this. At one point, the 3-time WPT champion was thought to be worth tens of millions of dollars. He was one of the three founders of PokerChamps (sold for $15m), he’s maintained a lucrative Full Tilt Poker sponsorship deal, he is a very successful backgammon player, and he’s likely made millions from live cash games. But as Hansen once said, he’s “not Bill Gates” and can’t continue to lose at poker like this. Did $2.5m Overlay force Seminole Hard Rock Poker Director out? The biggest stories coming out of the Seminole Hard Rock Poker Open (SHRPO) were not Dan Colman winning yet another tournament and $1.44m, or Jacob Schindler winning the High Roller and $570k. No, instead the biggest news involved a $2.5m overlay and Seminole’s Director of Poker Marketing, Ray Stefanelli, being on vacation during a High Roller dispute. Speaking of the latter, Stefanelli resigned from his position, which is interesting timing considering all of the drama. There’s no official word on this, but the $2.5m overlay in the $10m guaranteed Main Event was no doubt a big blow to the Seminole Hard Rock. So it’s certainly not ridiculous to think that Stefanelli could’ve been kindly asked to resign. Whatever the case may be, he’s rumored to be landing on his feet with the Borgata. Stefanelli worked as Borgata’s Director of Poker Marketing for seven years and is said to be resuming his work with Atlantic City’s leading casino. ‘Elvis’ Joseph Levine, a colorful dealer at the WSOP for three decades, was tragically shot and killed at his Las Vegas home. Levine’s two brothers and an acquaintance named Marjorie ‘Maggie’ Fiora were swimming in his pool while he remained in the house. Fiora got out of the pool and went inside, with the two brothers hearing a gunshot a few moments later. The 30-year-old then told the brothers, “I have to kill him” as she fled the scene. One of the men was able to wrestle a shotgun away from Fiora during her escape. Fiora, who’s described as a homeless woman who sometimes stayed with Levine, was later caught by police in a nearby backyard. As for Elvis Joe, he was rushed to University Medical Center and eventually pronounced dead from a gunshot wound to the chest. 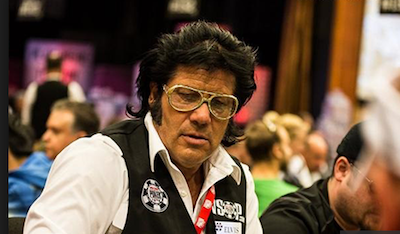 The 56-year-old leaves behind a legacy that includes dressing like Elvis for the WSOP and sometimes singing songs to players.